O primeiro mês do ano chegou e foi embora num abrir e piscar de olhos. Hoje deixo aqui alguns detalhes deste mês. Dos looks publicados, maquilhagem e outras coisas boas. Janeiro foi bom, mas espero que os próximos meses sejam muito melhores. Obrigada por terem estado desse lado durante este mês! The first month of the year arrived and was gone in a snap. Today I show you some of my details from this month, looks, make up and other stuff. January was a good month but I hope that the next months will be much better! Thank you for being there during this month! Love all the edgy jewelry! You have a great style! És tão mas tão linda! Que detalhes giros ;) Gostei do post. Me encantan todas las fotos, esas olivas con ese vino, qué riquísima combinación!! Your accessories are always on point !! lovely pictures, I love your hand bags and the mac lipsticks! Giraça e extremamente simpática na forma como escreve. Loving the black hat girl! 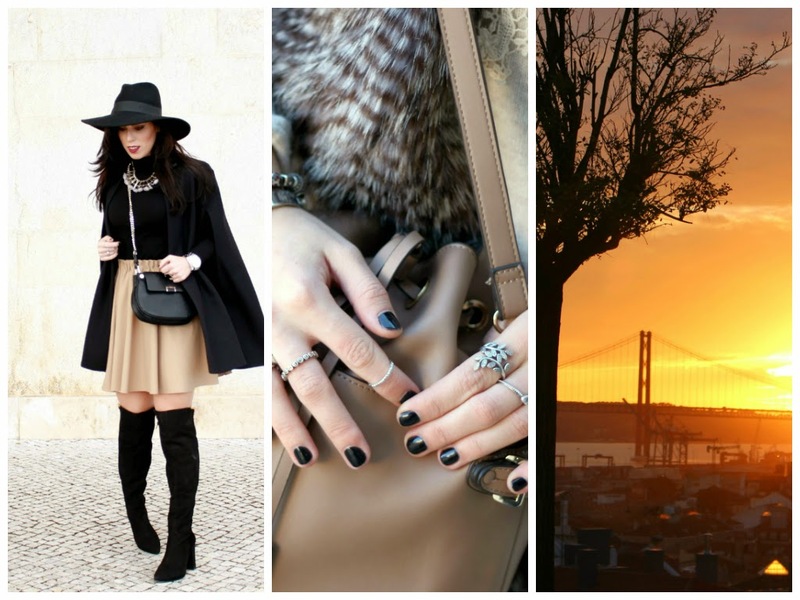 looked like such a stylish january! great photos! I adore those picture ! Adriana, és linda mesmo, é a minha conclusão destas fotos ahah! Ahah, obrigada Cátia, és uma querida! GREAT MONTH! All outfits are great! Love your January pics! You are so pretty with all the looks! Great photos and I love your style :) I love your blog and I have followed you with Bloglovin. If you ever get a chance to check out my blog I would be delighted, thanks! Foi um Janeiro cheio de fotografias lindas! Lovely picture!! Thank you so much for your comment and visit on my blog. There are new post, kisses. Que Fevereiro seja ainda melhor! Que fotos maravilhosas de se ver logo a uma segunda de manhã!! Foi um janeiro inspirador :). Looks like you had a great start to your year! Loved all of your outfit! adorei as imagens! parece q começaste bem o ano. os batons sao mesmo giros! It´s been gone sooo quick!! great picturres. This is perfection! You truly have impeccable style!! The look are all ideal, stylish !!! Love all your outfits, especially the last one ♥ You have a great style Adriana! Great looks! I especially love that cape! those food pics look absolutely stunning. It looks like you had a pretty decent January. So gorgeous you look fabulous! Thanks for stopping by! seriously wish I owned your wardrobe! Adorei TODAS as fotos! Lindas, inspiradoras :) E claro, adorei os looks :) beijinhos e boa semana! you look amazing! this month did pass by quickly! Lovely outfits dear ! Such a great pics too. Just started following you and would be delighted if you could do the same! Great photography! Your outfit is so well put-together. You look gorgeous! I love your style! That's excellent photography.